Leslie reminded me a few weeks ago that it's been almost a whole year since the A Day In The Life Of post, and - as you know - my days have changed some. Let's revisit, shall we? Leslie's going to do it too, and guess what? The alarm clock goes off at six, like it's supposed to, but because someone under three feet tall was playing with it, the volume is too low to wake me up. Mr wakes me up at 6:27 and I stumble to the bathroom. As I'm sittig on the toilet, I hear Miss come to the door and try to come in (which is why it's locked). I tell her to ask Daddy to take her downstairs if she needs to go. This makes her pound on the door harder until, eventually, she pees her pants, which is obviously way better than going downstairs to pee on the toilet. Cleaning her up and making her feel better eats up another ten minutes, and when we're all finally showered and downstairs it's already a few minutes after seven, which means cereal instead of oatmeal for breakfast. I change Jr's bum and get both kids dressed while Mr starts the coffee and gets breakfast on the table. The cereal saves us enough time that we're brushing our teeth about the same time we do every morning, and Mr heads out to clean the snow off the van and get it warmed up by about quarter to eight. I'm thinking that despite the bad beginning, things are back on track. I start to worry a little when Mr isn't back in after five minutes, but start to wrestle the kids into their jackets, boots, mittens, and hats anyway. (I. Hate. Winter.) Mr comes back inside and throws his gloves angrily to the floor. The van doors - which have been freezing up on us nearly every morning - did not freeze this morning. This is not reason to celebrate, as they have instead chosen not to latch. No big deal, Mr will take the kids to school in the truck, and then come back to drive me to work. Or not. The truck refuses to start. I realize that I'm very, very wrong. We're fortunate to live only three minutes down the road from my parents, and once again we take shameless advantage of our proximity and ask Dad to rescue us. He does. I finally get to work a half hour late, after a complicated fox/chicken/grain/farmer/boat scenario in which Dad drives us all to school, we drive him home, and Mr drives me to work. 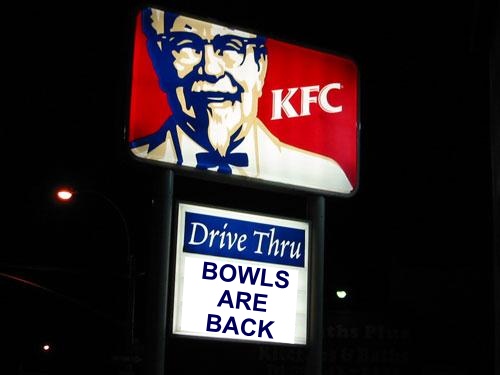 Against all reason we listen to the Colonel, and after picking the kids up from school we swing back to KFC and buy the infernal bowls. We finally get in the door, wrestle the kids out of their jackets, boots, mittens and hats (did I mention that I. Hate. Winter?) and sit down to "supper" by six. The kids eat their "food" - Miss is excited by the discovery of corn in her bowl, and Jr eats only the "chicken". We decide that the kids need we need the kids to go to bed early, so by quarter to seven they're in their jammies, teeth brushed, all storied up, and ready to be tucked in. Jr hands out sloppy kisses and tight sqeezes (no, the "u" was not omitted by accident), and is zipped up into his sleeping bag and put down. He cries for his nimmie about the same amount of time as it takes to close his door behind him and walk down the hall. It's expanded a little in the past year. I spend the evening lying on the couch, most decidedly NOT writing a blog post (sorry), and regretting the bowl decision most sincerely. Mr makes me the perfect evening snack: Gravol and ice cubes, and I figure if I'm going to suffer, I'd like to do it in my sleep. I spend the next two hours in bed but not asleep, enjoying the pleasures of acid reflux and trying not to throw up in my mouth.